We’ve always loved summer rolls for their refreshing, crisp veggies and the sweet-salty dipping sauce. The best part about summer rolls is that they require no cooking and are an easy vegan and gluten free snack or lunch to prepare. We decided to fill our rice wraps with cucumber, carrots, basil, red pepper, purple cabbage, and baby spinach but you can really use any fresh veggies you have in your fridge and experiment with adding in other fresh herbs that you like, such as mint and cilantro, or even add in some marinated tofu, tempeh, shrimp or chicken for additional protein. Our dipping sauce is made with almond butter and ginger for some plant based protein and delicious flavours to infuse with the veggies. Spinach is a wonderful leafy green packed with iron, vitamins and minerals. We always recommend keeping a box of baby spinach in the fridge because it’s an easy way to add greens to just about anything: wraps, salads, omelettes, soups and smoothies. Spinach contains Vitamin K, fiber, potassium, magnesium, calcium, phosphorus and thiamine. Spinach is a good source of iron, making it wonderful vegetable to include in your diet if you’re vegan and not eating animal products. The iron found in spinach is more absorbable when it’s cooked, as opposed to eating it raw (so make sure to saute your spinach or add it to a soup if you want to eat more iron). Spinach also contains small amounts of an antioxidant called alpha-lipoic acid which plays a role in balancing glucose levels and increasing insulin sensitivity. Spinach contains our favorite green pigment chlorophyll, which gives plants their beautiful green color and has been studied for its potential role in cancer prevention. 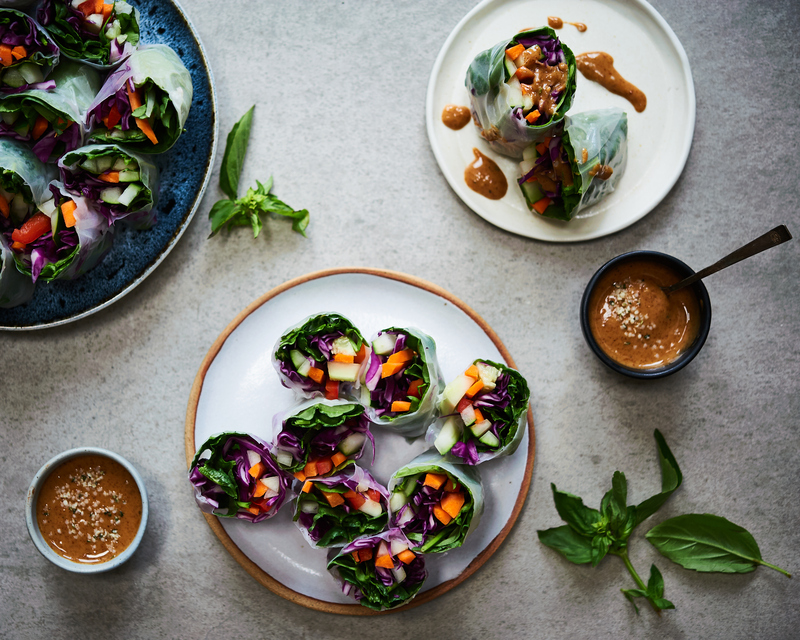 Purple cabbage adds wonderful color to these summer rolls, along with many more antioxidants, vitamins and minerals. Being a member of the cruciferous vegetable family, purple cabbage is a great food to include in your diet to get sulfur-containing glucosinolates, the compounds that have been studied for their role in cancer prevention and supporting the liver in breaking down toxins. Purple cabbage is a good source of vitamin C, which is always helpful for your immune system. We hope you’ll give this recipe a try and make these summer rolls as an appetizer, for a snack or for lunch. They are best eaten fresh when made, but if you need to prepare them in advance you can place a damp paper towel over them to prevent the rice paper from dying out. The sauce will stay fresh for several days when stored in the fridge. Chop all the vegetables in thin slices. Fill a deep dish or saucepan (that’s 2 to 3 inches deep) with hot water. Place each sheet of rice paper in hot water for 10-15 seconds to soften slightly. Remove the rice paper from the water and place it flat on a plate or cutting board. Place the vegetables in the center of the rice paper. Roll the rice paper to form a wrap (roll over the edge closest to you, then fold in the left side, then the right side, then roll over completely). Place all ingredients in a bowl and stir, except the water. Slowly add the water as needed and mix until smooth (you may need more or less than ¼ cup of water).